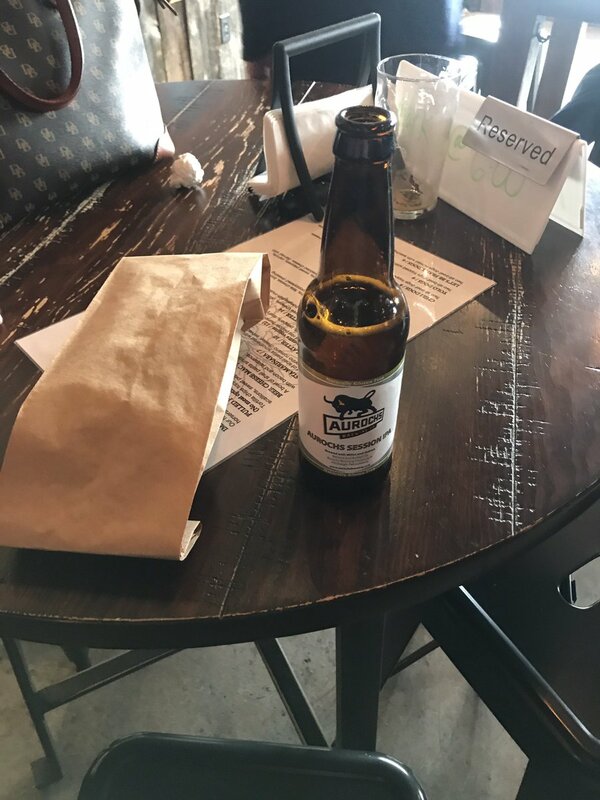 You can find Aurochs all over Pittsburgh - at different bars, restaurants, bottle shops, grocery stores and beer distributors. If you are out this weekend, you can also spend time with us in the tasting room or at some of the following events. Cheers! This week the Brewers Association host the 2019 Craft Brewers Conference in Denver, Co. Our own Doug Foster will be on hand to take in the conference and actually speak at the conference as part of group talking about #glutenfreebeer. The group includes Karen Hertz & Connor Reeves from Holidaily Brewing Company, Twila Soles from Grouse Malt House and Michelle Colgrave, Principal Research Scientist at CSIRO Agriculture and Food and Research Professorial Fellow at Edith Cowan University in Australia. Doug will spend the week in fellowship with some of the best brewers and gluten free brewers in the country, learning, networking and, hopefully, growing craft beer. To mark the occasion the teams at Holidaily, Grouse and Aurochs came together to produce a beer in collaboration. We named the beer Brewnited Red IPA. It was tapped at Holidaily two weeks ago and last week at Aurochs. You may have seen us post about it. This week - during the Craft Brewers Conference - we invite you out to the tasting room Thursday, Friday and Saturday to try this beer and reflect on how far gluten free brewing has come and where we can go together. Cheers! We are about to kick things off this weekend with James & Debbie Tobin. Hope to see you there! Visit the tasting room tonight and get your hands on some fresh beer and great eats from Kilimanjaro Flavour! Doors open at 4pm! Buzz Worthy Pub Trivia will be here at 7pm to get things started. We have some great stuff on tap - including Brewnited Red IPA - our collaboration with Holidaily Brewing Company and Grouse Malt House! Holidaily Brewing Company is an incredible dedicated gluten free brewery out of Golden, Colorado. You could win a growler full of Brewnited if you can out think the Aurochs team! As we get ready to tap Brewnited Red IPA this week in the tasting room - our gluten free collaboration with Holidaily Brewing Company - we wanted to share this recent article from Breweries in PA written by our own Head Brewer Chris Carr. Chris provides a great overview of gluten free brewing and highlights some of the challenges and opportunities that exist. We are so happy to be hosting Cousins Maine Lobster - did you know beer and lobster tacos are perfect in tandem? Who knew?! We are open tonight until 8pm. Today we are taping the beer brewed in partnership with our friends from Butler Brew Works - Mexican Hot Chocolate! The Mexican Hot Chocolate is 8% ABV and hits you with a continual wave of evolving layers of flavor. This beer was brewed with a special pepper blend - including chili and habanero peppers - cocoa nibs, vanilla beans, honey, cinnamon, lactose (milk sugar) and gluten free oats. All of this was infused with our typical millet and quinoa based grain bill. *Contains dairy and gluten free oats. The heat from the peppers and the sweetness of the chlorate play very nicely on your taste buds. Chocolate lovers will enjoy the chocolate backbone and bold flavors of this beer. The history of chocolate begins in Mesoamerica. Fermented beverages made from chocolate date back to 350 BC. The Aztecs believed that the cacao seed was the gift of Quetzalcoatl, the god of wisdom, and the seeds once had so much value that they were used as a form of currency. Originally prepared only as a drink, chocolate was served as a bitter liquid, not a sweet edible treat as we know it today. In many Mayan households, chocolate was enjoyed with every meal. Mayan chocolate was thick and frothy and often combined with chili peppers, honey or water. It was believed to have aphrodisiac powers and to give the drinker strength. Today, such drinks are also known as "Chilate" and are made by locals in the South of Mexico. After its arrival to Europe in the sixteenth century, sugar was added to it and it became popular throughout society, first among the ruling classes and then among the common. Come enjoy it with us! Here is the draft list for this weekend! You might notice a few new carry out options available in CANS! Cheers! Free Beer! We are filming a little something. If you are available this afternoon (3/20 @ 4:30) we would love for you to swing by the brewery to join us. Benefits include beer! 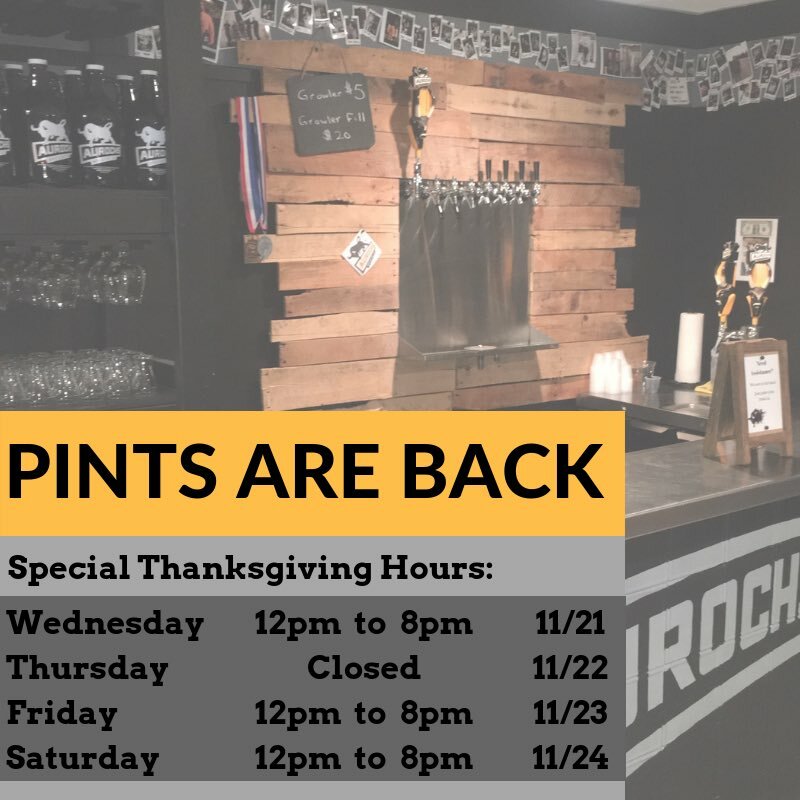 Did we mention beer? Message us for details. Cheers! 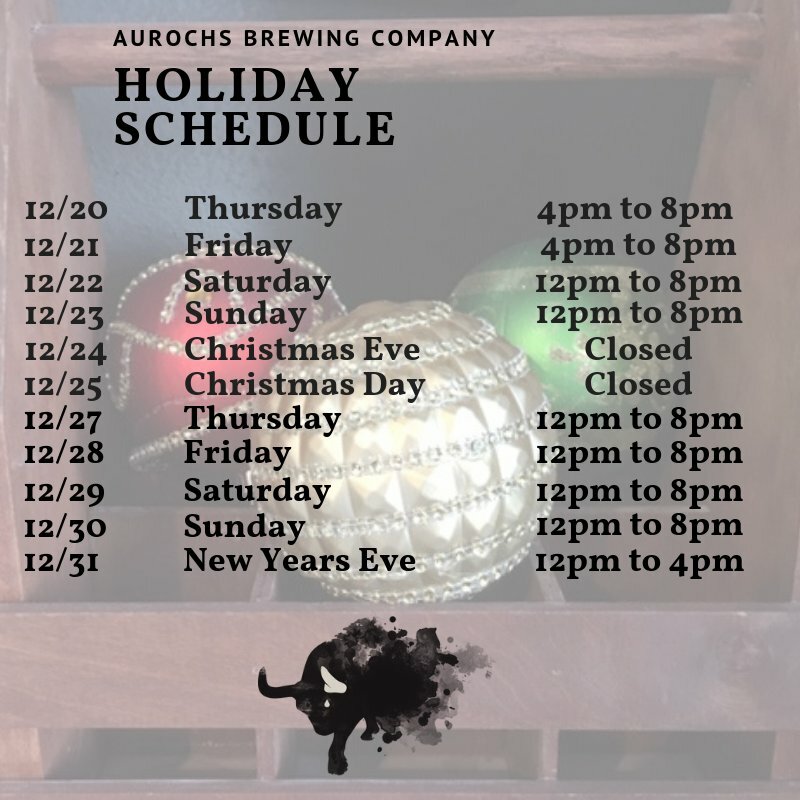 Come celebrate with us at Aurochs today! Our St. Patrick’s Celebration Brunch starts at noon and we have plenty of walk up meals available. 2 boxty, bangers and braised cabbage for $15. We are having an amazing time at Soergel Orchards for their St. Patrick’s Day Celebrtion! Abbots Cross is here belting out Irish pub favorites. They will be at Aurochs TOMORROW (3/15) night from 5:30-8pm. Join us! Here is the draft list this weekend! It’s the same as last week but this week we have Cousins Maine Lobster visiting us on Saturday - 3/9 - from 2-8pm! Here is what is on draft this weekend! Stop by and pick up some Porter or try our Orange Creamsicle Ale - Pourange Rhymes with Orange. Friday night we are hosting a happy hour - two free tasters for all visitors. Realtor Nathan Pazsint from Berkshire Hathaway will be on hand to answer any of your home buying questions. Saturday night we will be hosting a new food truck - Kilimanjaro Flavor! Their food is combination of three flavors - Indian, Middle Eastern and aromas of Zanzibar. Delicious, gluten free and not too spicy! We have a lot of beer heading out the door this week. Aurochs beers are #PAbrewed and available in over 35 counties in Pennsylvania. Help us grow and #AskforAurochs wherever you buy fine craft brews! It's time to stock your fridge for the week. We are open until 10 PM! We are stocked up and ready for you! Come hang out, have a beer and get your photo on the wall. We are open until 10 PM tonight. We are getting some headshots done for our new website. Soon it will be even easier to connect with Aurochs and find the information you need. Head brewer Will squeezes in a little "quality control." Come taste his hard work this weekend! Bottles of Blonde Ale and Session IPA are stocked and ready at the tasting room! We are open today until 10 PM, tomorrow from 4 PM to 10 PM and Saturday noon to 10 PM. 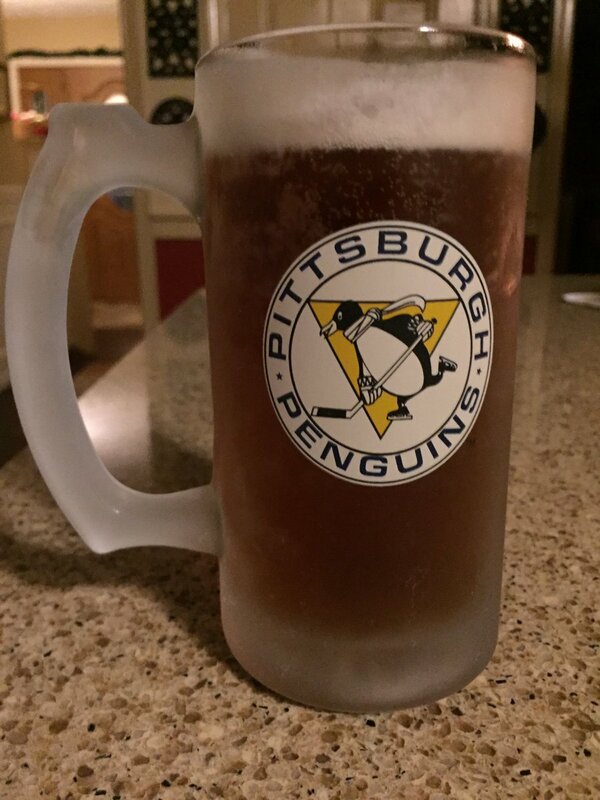 Enjoying the @penguins chase the #stanleycup @halsbar with the brew team!